Fears have been high up in doggy discussions recently. It’s the Fireworks season in the UK and this is what’s brought them bubbling to the surface again. Remember, remember, the 5th of November - gunpowder, treason, and plot! And one thing common to a lot of these discussion threads was the surprise registered by owners of reactive dogs who were not upset at all by the noise. Some of these new owners had got prepared for the onslaught and were expecting the worst - then were utterly astonished that their dog couldn’t care less about it all. So perhaps a little look at the subject of fear would be helpful here. Is all fear the same? Humans are born with only two fears: fear of falling and fear of loud noises. And these fears are stimulated in the Apgar tests for newborns, to elicit the startle reflex and check that all is well neurologically with the baby. All other fears are learned. So fear of ghosts, planes, spiders, heights, and so on, are acquired on our journey through life. Many of these fears are developed early on, and can be heavily influenced by our family's response. A mother who is afraid of spiders can quickly transfer this fear to her children, while the mother who is happy to pick up an insect and take it to a place of safety is likely to have children who are curious about the other species in their environment and not fearful of them. It’s also true that a natural predisposition to be cautious around predators means that people are more likely to be afraid of creatures than of … bicycles, or trees. Now the jury is out on whether dogs are born with any fears. Certainly there will be a predisposition to fear certain things, and the social influence of the mother and the environment in which the pups are reared are definitely going to have a big effect. Hence the supreme importance of early and proper socialisation for puppies up to the age of 12-15 weeks (jury is out on the timescale too). But we can certainly influence this fear by showing extreme fear ourselves. Will I make my dog worse if I cuddle her? Fear is an emotion. And you cannot reinforce an emotion. It’s either there or it isn’t. You can only reinforce a chosen behaviour. While it is not possible to reinforce the emotion of fear - that is, to reward it and encourage it and make it stronger and more likely to occur - by giving comfort to a frightened person or dog, it’s certainly possible to plant the idea that fear is the correct response to something. Hence the general firework advice to mask the noises and flashes as much as possible (loud tv, curtains drawn, prepare a den) and carry on as normal yourself. You can't make your dog more afraid by comforting her. What’s conditioning? And what’s counter-conditioning? So fears grow in people and in dogs through experience, through social learning, and from a pre-disposition - self-preservation is all-important, so being afraid of things about to pounce on you is sensible. There’s also genetics to factor in. Some dog breeds are more alert to strange things in their environment than others, and are going to be faster to develop fears - unless that careful socialisation, familiarisation, and habituation, is done. So your puppy is being conditioned to certain fears through his life experience. A snake appears and mum runs away from it: noted - snakes are dangerous. Counter-conditioning is when we weigh in to lessen a fear, or lessen the impact the fear will have, by changing the association in the dog’s mind to something good. If every time that pup sees a snake you stuff pork pie in his mouth - his emotional response is going to change, over time! No, we don’t want him getting curious about the snake and approaching it - but we equally don’t want him to panic and run off - into the path of our modern-day killer, a car. Your dog is going to be afraid of things he’s learnt to be afraid of. It follows that without that experience he’s not going to have the fear in place. Of course there are dogs who are so psychologically damaged that they have a generalised fear of everything. But even these can be brought to a level of comfort with patience and dedication, and possibly medication. So being afraid of snakes is not going to make your dog also afraid of cars. And being afraid of other dogs is not going to make him afraid of horses, or sheep, … or fireworks. Cricket will sleep through a thunderstorm! Cricket the Whippet will sleep through almost anything! In my own household I have two (Lacy and Coco) who will ignore most fireworks, but bark at a very loud bang - it’s an “alert bark” not a panic attack - one (Cricket the Whippet, the professional sleeper) who is not at all bothered, and Rollo the usually independent Border Collie who gets very unhappy and worried. During the firework season Rollo sticks to me like a limpet, wedging himself under my legs and following me pathetically wherever I go. It’s at least reassuring that I am considered a place of safety. The situation is manageable without medication, as he doesn’t panic and damage himself trying to escape - as some dogs do. The interesting part - for the purposes of this discussion - is that Rollo is not what is commonly termed “reactive”, while Lacy and Coco most definitely are. Border Collies are a sensitive breed with superb hearing. So if they’re going to be worried about anything it’s understandable that loud and sharp noises would be up there. But it’s not automatic that a Collie would be noise-sensitive, any more than the dog who is afraid of men in hats, for instance, should also fear children. So what you can take away from this is that fears will exist in your dog; you can minimise those fears with appropriate socialisation at the correct age; you can help make those fears manageable with careful training; and that a fear of one thing does not automatically imply a fear of anything else. 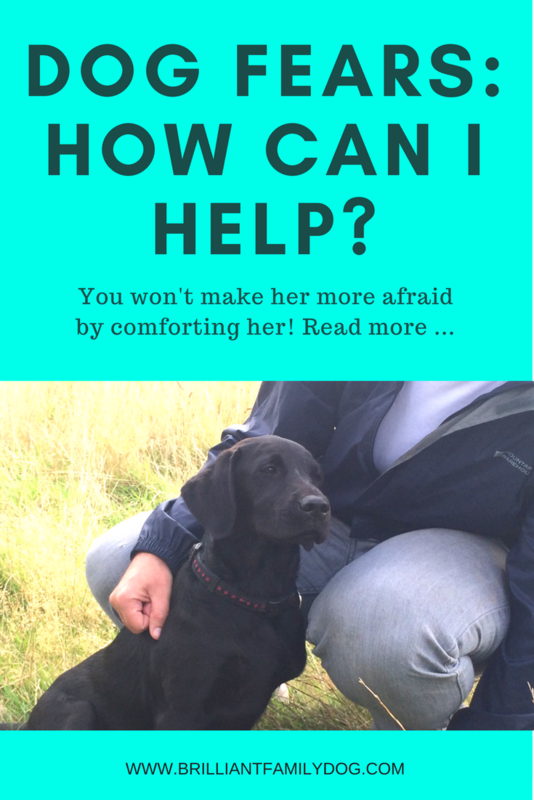 Want some more help with your fearful or reactive dog? Here's a free email course that will get you on the road to success! Far, far, easier than stopping your dog, is to ensure he doesn’t start! It may be that you’re new to living with a dog, and you can’t foresee what’s likely to happen. Once you have a few dogs “under your belt” you get much quicker at spotting hazards in advance. So, if your dog already has an established behaviour pattern that you don’t like (and if he was re-homed with you, he may have come with this habit already well-learnt), you want to look at what causes that action to happen. Perhaps your dog jumps up on visitors. What happens before he jumps? So you have three clear points there where you could make changes. 1. When visitor arrives, or - if expected - before visitor is due, settle your dog in his crate or another room with a chewtoy or stuffed foodtoy. 2. As the visitor is admitted to the house, your dog is either safe in his crate or other room, or is on lead beside you with your foot on the lead, and cannot jump. 3. If visitor wants to greet dog (preferably when you ask them to) dog has to stay sitting in order to earn this mighty reward. So there you have three easy fixes to a nuisance behaviour with little effort - just a little advance planning. This is along similar lines as the first point, but this time my correspondent has picked up on the fact that something happens first, then the dog reacts. So we’re ahead already! 4. The other dog has gone without the need to be shouted at! So you can see by now, that your dog never does stuff out of the blue. Unless your dog has dementia, there’s always a reason, just like there is for anything we do. The trick is in identifying the reason so we can fix it at that stage, without waiting for the full bad thing to happen. And one of the commonest times I hear this statement is in regard to dogs reacting - perhaps leaping up and snapping. There’s always a reason! Dogs always run through a sequence of calming signals before biting. Granted, they may run through it pretty fast, especially if they do it a lot. But they do do it. Just as you’d be unlikely to spin round on that stranger and pull a knife: rather, you’d fix him with a frosty glare and maybe say something loud enough for others to hear. So the dog who bit “out of the blue” will probably have tried to turn away, gone still and stiff, shown the whites of his eyes, given a stare, wrinkled his lip, mumbled a growl, swished his tail stiffly, maybe snapped - all steps ascending the Canine Ladder of Aggression - before he felt forced to bite. Fighting is dangerous for all parties, and is not entered upon unless it’s the only choice. By the way, dogs are so much faster than us, that if a dog is going to bite you, you are going to get bitten. There is no “He nearly bit me but I moved away in time.” If you are genuinely threatened by a dog, your best course of action is to avert your gaze and posture, keep your arms still, and stop being a threat. A child running away screaming and flapping arms and legs is a great target for a chasing dog! Here we have a combination of acting too late to affect the outcome, and using punishment to try and fix the situation. Both are doomed to failure. We’ve seen above that you have to identify the precursors to an action if you want any chance of changing it. If your dog “always” does whatever it is, this means it’s a firm habit which you are allowing to happen every time. Change something! Find out what the sequence is and interrupt it. And as for saying NO, this really is not going to help. Saying NO gives the dog no information about what you do want, and just tells him that you are angry with him and adversarial. You’re not on the same side as him any more, so he can’t expect any help from you. This is exactly what we don’t want in our relationship with our dog! Instead, decide on what you want him to do instead, teach him how to do that, reward his response enthusiastically, and you now have a new go-to action for that situation. A lot of these “beginner” mistakes can easily be avoided or changed with a little foresight. Don’t expect your dog to be a small hairy version of a civilised human brought up with our society’s values. 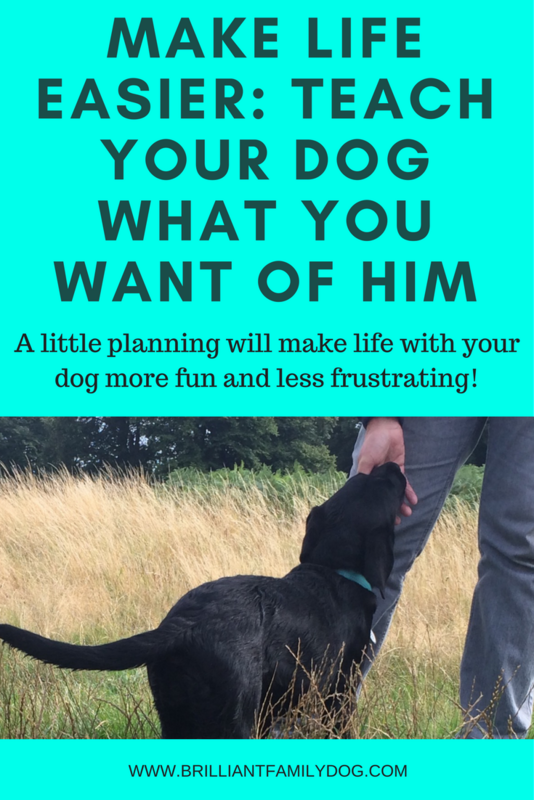 So think of how he sees the situation - get inside his head and think like a dog - then you can pick out the turning points where you can directly influence the outcome, with a happy dog! You have to be proactive, not a firefighter. This is true of life in general, and never more true than in developing the magical bond with your dog. Lots more help can be found in other articles here at Brilliant Family Dog, and specific “recipes” to change things you don’t like can be found in our free 8-part email course. Let’s think of ourselves first. How close is too close to your child? How close is too close to your friend? How close is too close to your postman? How close is too close to a stranger asking directions? How close is too close to a drunk, shouting in the street? Clearly, you’ll have a different answer for each question. Our personal space requirements vary from situation to situation. They also vary across the planet. Get your free email course here! The Japanese, for instance, prefer a larger personal space than many Westerners are used to, and it may not be breached by touching! That is the height of insolence. So the personal space we have which is an essential survival mechanism can also be affected by culture and learning. Our dogs are just the same! Dogs too have a personal space. But because dogs are so fast, their personal space is much larger than ours. And the cultural differences come in too, in the form of breed characteristics. Companion dogs who have been bred to stay close to their owners will tend to manage with a smaller space. If you have a guarding or guardian breed - then they alert to anything that shouldn’t be on or near their “patch”. Their space is huge. These are factors you need to keep in mind when out and about with your dog. What is an acceptable space for you to pass someone on the street, may not be acceptable to your dog. You will have to teach her that the passing person has been assessed by you as non-threatening, and does not need to be jumped up on, barked at, or grabbed while passing. Fitting into our way of life is not straightforward for our dog. We kind of assume they’ll just come ready-programmed to respond the same way we do. But we have been learning for twenty years (or many more!) how to relate to our fellows, and have a headstart by virtue of the fact that we are the same species. Teaching your dog the social skills necessary to fit in with our world is essential. But it shouldn’t go against your particular dog’s natural instincts. You chose that breed because of her characteristics. So you need to work with them to achieve a dog who is comfortable in the places we take her. And how about other dogs? When it comes to your dog’s personal space with regard to another dog, then that space is bigger again! So passing someone on the street within your personal space may work for your dog. If that person has a dog with them, it may change things entirely! If your dog tends to shoot first and ask questions later, then changing your response to passing people with dogs will make your walks infinitely more comfortable and stress-free. You need to develop a kind of radar scanner on the top of your head, which will pick people and dogs out at a great distance, giving you time to plan your getaway. While your dog is seeing the oncoming dog, you can post some quick treats into her mouth, then with a cheery “Let’s go!” turn and head along your escape route, giving more treats all the while. You can simply cross the road, wander down a side-road or driveway, or even turn and go the other way till there is sufficient space to pass. Playing a quick focus game with your dog will help. Just this new habit alone will make a tremendous difference to your walks. It’ll help to keep your dog calm, and when your dog is calm - you can be calm. And when you are calm - your dog can be calm! It’s a virtuous circle you want to get into, and it starts with you changing your response to an oncoming dog. That response is totally understandable, if in the past an oncoming dog has resulted in your dog reacting - barking, lunging, as if her life depended on it. But, while understandable, it’s not helpful! Maybe your walk will take a little longer with these detours. As long as you’re both enjoying it - who cares? 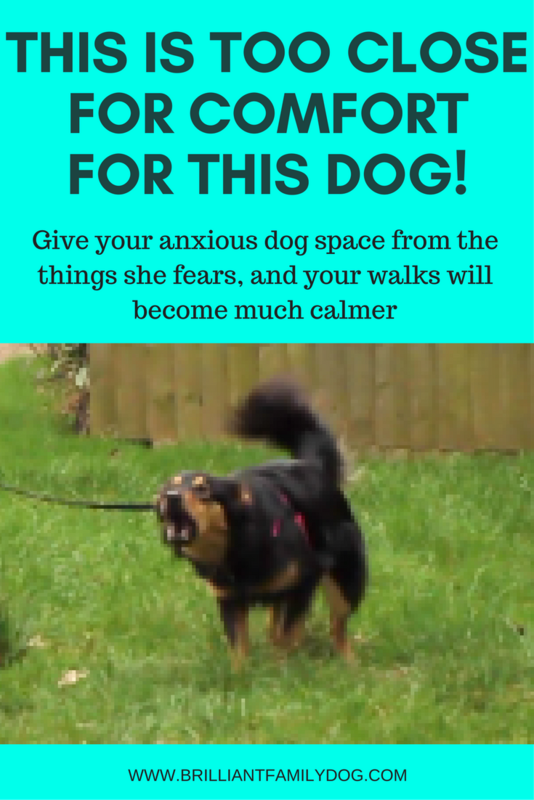 For some solid advice on how to manage your reactive dog so that walks are less stressful all round, get your free email course here.